My 4 year old is...how do I put this, difficult?! Basically if he gets his way and you don't say no to him, he's an angel. But the minute I ask him to do something he doesn't want to do, it's an all out freak out session. I try and give him choices to make him feel in control, butsometimes that isn't an option. Lately he has been saying some really hurtful things. I have tried ignoring, because I know he seeks attention, positive and negative. I have tried disciplining with quiet time in his room. I have tried taking things away from him that he enjoys. I have made him skip outings that he is really looking forward to as a punishment, but nothing seems to work. I also got a chart to keep track of good behavior with the ability to earn rewards. Obviously I am lacking some consistency, because I have tried so many tactics. Which has worked in your experience, over the long run? I know it's a stage, but I can barely stand it! Examples of what he says when he is mad...1. He will repeat what I say, such as "I don't like your behavior Mom." He tells me I am being mean and ugly about 3 dozen times a day. If I say no treat until after dinner I am a horrible mean person. If I tell him, I will do ____ if you don't behave, he will make threats right back, and say if you put me in time out I will scream as loud as I can ALL NIGHT! 2. He will tell me he wants to move away and he doesn't want me to have any kids and I need to live by myself. 3. Several times he said he wants to go to heaven to get away from us, and be with his dog who passed a way last year. When I ignore his behavior and tantrums he has gone so far as to hit himself in the head and spit at me. I know this is alot, but when are tantrums worth seeing their doctor over? And in your experience what tactic works the best to limit them? Because right now we have more difficult days then bad, and I miss my little guys smile!!! You are correct that much of his behavior is a stage that should improve if it is addressed appropriately. He needs to learn to behave when he does not get his way. We all know dysfunctional adults who still have temper tantrums (and few friends). We have seen this behavior in two of our boys. I bet he is super smart and sensitive. Part of your concerns center around your role. Taking away privileges like treats, play time and T.V. are important discipline tactics. Too many parents get fooled into trying to be a “buddy”. You are his only mother. It is position much more important than any friend. Parental example, guidance, and discipline will largely shape his personality and beliefs. When a 4 year old says hurtful things like “ I will scream as loud as I can all night long” or “I don’t like your behavior” he is hoping it will bother you and make you upset. Stay cool. When our children say mean things during discipline, I reply that we discipline them "because we love them and want them to grow up to to be the best that they can be". If he hits himself or bangs his head during tantrums, let him. And don’t let it bother you. He needs to figure out he is only hurting himself. “Time outs” should be effective in dealing with his “freaking out” episodes (tantrums). 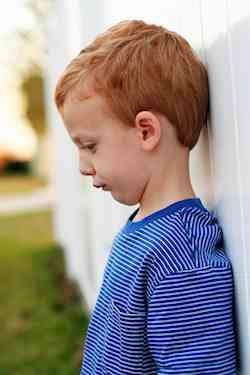 “Time outs”will work if he will sit in time out or if you can keep him in his room until he calms down. If you need to, install safety door handles or purchase a lock so he cannot open the door. At his age, he needs to show submissive behavior to get out of “time out”. At our home we ask our children to say “Yes, Dad” or “Yes, Mom” when spoken to. After a time out, we will call our son over to discuss the “time out”. “Jimmy, come here”. We expect Jimmy to say “Yes, Dad” and walk directly to us. If he does not do both, I send them back to time out and try again in a little bit. During the “time out discussion” we ask them 2 questions, “Do you know why I had to send you to time out?” and “Can you do better?” They need to answer both or go back for more “time out”. In your son’s situation, play acting will probably help. Suppose he freaks out about turning off the T.V. After a “time out” and the “time out discussion”, ask “How should you have acted when I asked you to turn off the T.V.”. Then play act it out. Put him back in his chair, turn the T.V. on (for only 1 minute) and walk into the room and say “Jimmy please turn the T.V. off”. If he fails, coach him some. If if fails miserable and ends up in a fit, he goes back to time out. If he succeeds (even with some coaching), than it gives you a chance to praise his good behavior. Practice a few times and heap on the praise.